The kiddos and I went to a local orchard to pick up some apple cider to bring to their recital this past Friday. 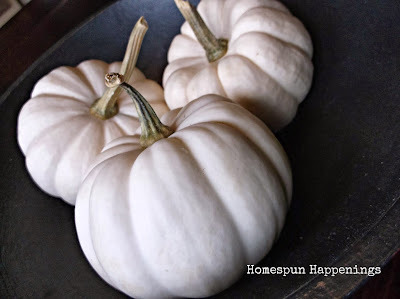 As I was there, I saw these mini white pumpkins 4 for $1. Being the big spender that I am, I bought a whopping 4! :) I realized when I got home that you really need to decorate in odd #'s, so one lonely ole pumpkin made it's way out to the front porch. Our family has never celebrated Halloween. 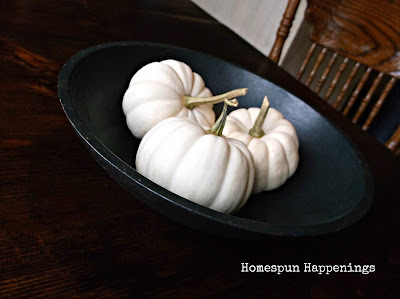 That is why you will not find any handmade Halloween decor posting on my blog. I am all for celebrating the Harvest time of year. Fall is my favorite time of year. I do love the warm colors of fall, but these little white pumpkins sneaked their way into heart this year. Maybe it is the new "Old White" look of my Kitchen that sparked a new desire for all things old white. Are you loving the warm colors of fall or have little white pumpkins become a favorite of yours too?